Hillsborough, NC, April 7, 2017	(Newswire.com) - ProPatient.com, a provider of interactive online patient education tools, announces its collaboration with the National Blood Clot Alliance (NBCA), Advanced Studies in Medicine (ASiM) and Healtheo360 in their joint interactive simulation program, establishing an innovative online resource to support caregivers of patients with Venous Thromboembolism (VTE). The program is designed to empower caregivers to take an active role in their loved ones care, as well as to be a resource for VTE treatment options that can assist with risk reduction and recurrence...all while revolutionizing the delivery of information. 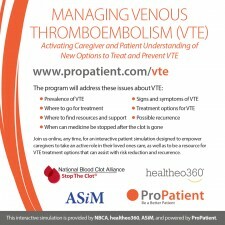 The collaborative virtual program entitled “Activating Caregiver and Patient Understanding of New Options to Treat and Prevent Venous Thromboembolism (VTE)” explores available VTE treatments and medications, provides suggestions for caregivers to improve communication with their loved one and their healthcare provider, and offers relevant resources and materials. NBCA works on behalf of people who may be susceptible to blood clots, including, but not limited to, people with clotting disorders, atrial fibrillation, cancer, traumatic injury, and risks related to surgery, lengthy immobility, childbirth and birth control. NBCA accomplishes its mission through programs that build public awareness, educate patients and healthcare professionals, and promote supportive public and private sector policy. National Blood Clot Alliance sees a future in which the number of people suffering and dying from blood clots in the United States is reduced significantly. “Educating patients and caregivers is our best and primary method of prevention,” said Randy Fenninger, NBCA CEO. Healtheo360 is a caring community for patients, their caregivers and family and friends to share their stories of inspiration, motivation and support. It includes health related support groups, related news articles and information, and the ability to safely share your story by video or journal entry in a secure and protected environment. “Healtheo360 is the leader in building and managing powerful, highly engaged patient and caregiver communities designed to provide support throughout their entire health journey- from diagnosis to end-of-life,” said Timothy J. Foley, Senior Vice President of Healtheo360. ProPatient is an online educational platform that utilizes interactive video and engaging simulation, providing caregivers the opportunity to simulate virtual role-play scenarios to improve their knowledge and skills. The ProPatient mobile app is the companion app for a simulated doctor visit. “The program includes strategies and best practices for communicating with one’s healthcare provider, and empowers caregivers to take on an active role in the patients’ health care. The resources provided in this program can help you start an open conversation with your loved one’s Doctor,” writes David Hadden, Co-Founder and Chief Game Changer of ProPatient. ASiM is partnered with what are, arguably, the most acclaimed medical institutions in the world, to develop and disseminate exemplary healthcare education. ASiM contributes an in-depth knowledge and experience in state-of-the-art e-learning applications and publications to the program. “We understand the principles of lifelong learning. We understand the learning cycle. Educational planning and design is inherent to our processes, and is especially important when creating and providing education for caregivers and patients,” according to Daniel Guinee, Executive Vice President for Strategy and Innovation at ASiM. 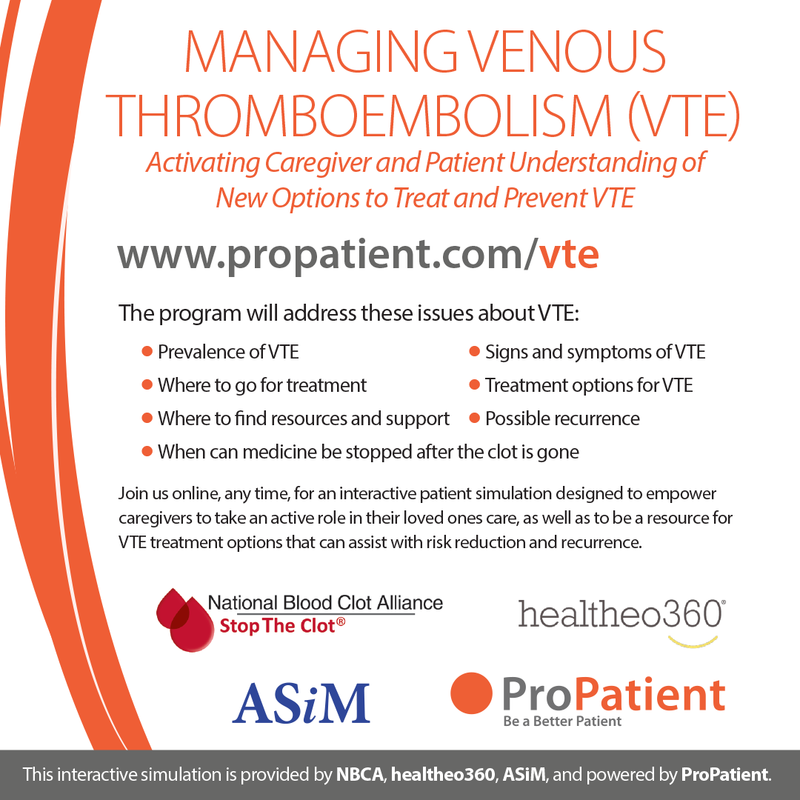 The patient program will be free for all participants and available via the websites of the collaborating organizations: www.stoptheclot.org, www.propatient.com/VTE , www.asimcme.com.